Since the start of the 2nd half of 2014, Qualcomm has had a rough go of it. After peaking at $81.05/share, it’s been all chop and drop. Just look at that massive 14% drop in the share price last week subsequent to beating earnings estimates but confirming that Samsung will drop Qualcomm’s Snapdragon chipset and go in-house with its own proprietary technology for the new Galaxy release. The loss of that one particular Samsung line caused Qualcomm to lower guidance for 2015 revenues by $800 million. Stop the presses! You mean Qualcomm may, as in possibly but not certainly, have 3% less in revenues than what was projected for the entire year?! That’s definitely grounds for revaluing a business lower by 14% within days, because your valuation models weren’t skewed before and this new information means everything. You have to love the market. It consistently puts great businesses on sale during a year. You just have to have a list, understand the fundamental values, and be patient. It’s not just the loss of Snapdragon in the new Galaxy and lower guidance. It’s also the uncertainty of the antitrust probes that have been reopened by China, Europe, and the US. Qualcomm’s market-share in mobile technology is so vast that the issue may never be fully put to rest. Countries can and will continue to reopen cases regarding Qualcomm’s trade practices as long as they continue to maintain such a strong hold of the market with their wide-ranging patent portfolio that gives them such a huge cut of the telecommunications action. Reminds me of the scene in Goodfellas, where Ray Liotta’s character explains what it’s like to go into business with the mob. Slow sales? FU, pay me! R&D too high? FU, pay me! Having trouble innovating? FU, pay me! I don’t want to mischaracterize Qualcomm as I truly appreciate their business model, but you get the point. Qualcomm is the emperor of all that is 3G technology. Their patent portfolio is so immense that there is a never-ending line of vendors waiting to kiss the ring and pass along envelopes filled with cash. That’s one of the many reasons Qualcomm is so great. Their lordship over CDMA is simply a money mint and all of their competitors around the globe can’t stand it. It appears as if the China anti-trust issue will soon be put to rest with minimal damage, from a relative standpoint. With any luck, they’ll pay their fine of around $1 billion or less and lose some concessions but still be in the game in the ever-important Chinese market. No government is going to kill a golden goose like Qualcomm and all the tax revenues that they represent. I suspect the EU and the US may even just end their own probes with very little in the way of remediation, but that is pure conjecture. These fears surrounding Qualcomm are not completely unfounded as a worldwide attack on the company’s ability to extract royalties is a clear and present danger. However, as I noted before, Qualcomm is a cash cow and in light of the cronyism that runs rampant through the developed world do we really think this is the company where regulators stand up and decide to fight for something? Really, I suspect a great deal of the matter depends on the strength of the relationships of Qualcomm’s competitors with government bodies to possibly influence the regulatory inquiries. Over the last 8 years, Qualcomm’s corrections have essentially kept time with the greater market. Observe the price action on the following chart. More recently, the stock price has corrected approximately 23% while the market has continued its ascent. I am not inferring anything here, we’re simply reviewing the relationship between the greater market and Qualcomm while noting the current divergence in light of the company’s own gravity-inducing catalysts. Qualcomm has faced pressures from sovereign entities as recently as 2009 with South Korea and 2007 with the European Commission. The effects to the company’s ability to generate free cash flow have been utterly negligible. Let’s take a look at the last 3 years’ worth of free cash flow results. All that cash and no long-term debt equals the ability to deploy capital in a shareholder friendly manner. The current dividend yield is now approaching 3%, which would imply a price per share of $55 if it reaches that point. These colossal free cash flows are a product of a royalty portfolio that accounts for 30% of the company’s revenues but over 85% of earnings before taxes. One of the most persistent questions about Qualcomm’s future profit generating ability is what happens as the wireless telecommunications space evolves(spectrum and equipment). That’s a reasonable concern in light of LTE’s advance. 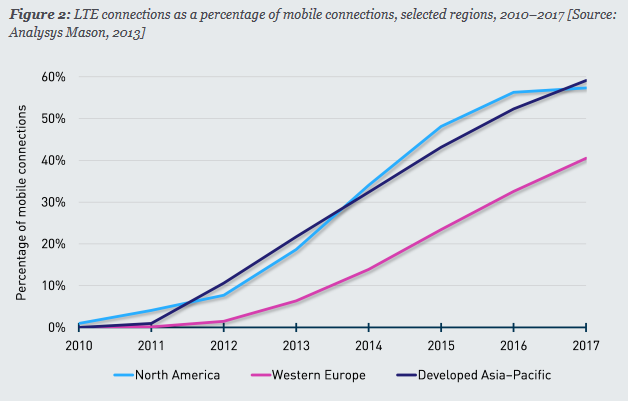 However, LTE is nowhere near to reaching maximum penetration around the world yet. Additionally, 3G compatibility within LTE devices will keep the royalty portfolio pumping cash for years to come. This is due to the fact that voice is still primarily handled via 3G while LTE is focused on data. Furthermore, the adoption of LTE has been very slow in Europe which leaves a very rich opportunity for continued penetration of Qualcomm chipsets in higher income per capita regions. Observe the potential in this chart from Analysys Mason, one of the leading international consultancies to the telecommunications industry. For a long-term portfolio option, these prices at the 52-week low appear to be quite reasonable to begin establishing a position. There are plenty of risks to assess before allocating capital, but the moat they have created around their business model in conjunction with the consistent eruption of free cash flow creates a very enticing opportunity. At this current share price their EV/EBITDA is at a reasonable 9 and they are approaching an EV/FCF of 10. Despite all the negativity surrounding their fiscal Q1 results, revenues and net income were still up YoY by 3% and 26%, respectively. Valuation depends on the variables in your model and what factors you prefer to place the most influence. As a potential long-term addition to portfolios, these share prices warrant a look. Let’s take one last look at the technicals. 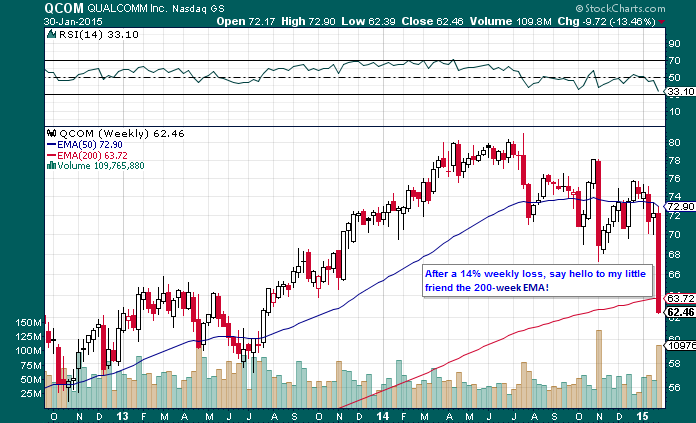 Qualcomm has dipped its toes into what appears to be a very strong support zone. As always, anything is possible in these highly volatile markets, so tread carefully. For true fiends out for any action, have a look at QCOM’s daily chart. It’s presenting the potential for a gap fill and long-time readers know how much I love the action of the snap-back. No further comment is necessary. The chart says it all. If you feel the need to trade last week’s gap then bear in mind the gap fills at approximately $71. Simple strategy, simple stop, but delivering profit may be a touch more complex. In summary, Qualcomm has the moat, prodigious free cash flows, and share price action that lends itself to constructively researching a potential investment. Last week’s ado may in fact just be about nothing. Allow the price action to inform you.